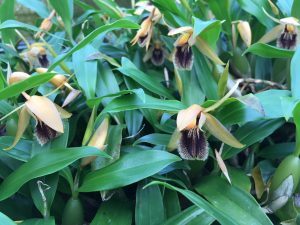 This species is a cool growing Coelogyne from South East Asia and the Eastern Himalayas. We have seen plants growing on the Bolevan plateau in Southern Laos at around 1200m where they form large clumps in evergreen trees. 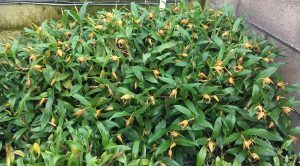 It is a very variable species in growth habit but in our collection is distinguished from the very closely related species Coelogyne fimbriata by having larger flowers with relatively smaller side lobes to the lip. The flowers seem to be very attractive to wasps that pollinate flowers in the greenhouse and presumably supply a last little bit of autumn sugar to the insects.